Who Has The NHL's Best Farm System? Who Has The NHL’s Best Farm System? With the importance of salary cap space growing more and more, it’s becoming increasingly apparent that successful teams start from strong prospect pools. The Pittsburgh Penguins, 2016 Stanley Cup champions, had either the first or second overall draft selection in four straight years, from 2002-06. While their team was floundering in the standings, this run of futility netted them top picks Marc-Andre Fleury, Evgeni Malkin, and Sidney Crosby, all core members to two Stanley Cup wins. The Chicago Blackhawks and Los Angeles Kings, who combined to win each of the previous four Stanley Cups, also suffered through prolonged periods of poor play before being turned around by their strong prospect pools. In today’s NHL, where the importance of having young and cost-controlled players contribute to your team has never been higher, several of the league’s worst teams in the last five years have assembled impressive pipelines of young talent. Since the Toronto Maple Leafs fully committed to a rebuild last summer with new GM Lou Lamoriello, they’ve been making headlines for their ability to quickly stockpile an impressive collection of talented youngsters. Arizona, Winnipeg, and Columbus are also all brimming with quality young players and look like they’ve got a bright future as well. Here’s a closer look at several of the top farm systems in the NHL, as well as a few top youngsters that could be the future faces of the NHL. The Winnipeg Jets haven’t been all that successful since the start of their new franchise, making the playoffs only once since they moved north from Atlanta in 2011. There’s a bright future ahead in Winnipeg, however, as the Jets currently have one of the best prospect pools in the entire NHL. The Jets have graduated a host of top picks to their lineup recently, including Mark Scheifele, Nikolaj Ehlers, and Jacob Trouba. The Jets have been patiently waiting for their young players to mature and lead them into the playoffs once again, but it seems that Winnipeg could be a true contender in the near future. Scheifele set a new career high last season when he crossed the 60-point threshold for the first time. Trouba, a restricted free agent yet to come to terms on a new contract, just completed his third full NHL season and appears to be a breakout candidate if he gets more offensive opportunities. In fact, there’s even more talent on the way, including this year’s second overall draft pick in Patrik Laine. Who are the Biggest Names? Headlined by Laine, the Jets’ deep group of forwards is undoubtedly their biggest strength. Hobey Baker finalist Kyle Connor is another potential star that could be a Jet next season, considering he’s already left the University of Michigan and signed his first pro contract with Winnipeg. Former early draft picks Jack Roslovic, Nic Petan, and Brendan Lemieux are also prospective NHLers for the Jets, ensuring depth at the position. Their defensive group isn’t quite as strong, but Joshua Morrissey gives them at least one young blueliner with top-four potential. Recently picked Logan Stanley is intriguing, but he likely won’t crack the lineup for several years. Goaltending is another area of strength, led by one of the top young goalies in Connor Hellebuyck and also boasting former World Juniors gold medalist Eric Comrie. The Toronto Maple Leafs have a legitimate case for possessing the best prospect pool in the entire league, likely a welcome departure from their old habit of trading draft picks away like candy. In each of the last three drafts, the Maple Leafs have grabbed a potentially elite player with their first selection. The three-headed monster of William Nylander, OHL MVP Mitch Marner, and first overall pick Auston Matthews gives the Maple Leafs the best trio of prospects they’ve had in quite a while. The young talent at the NHL level is thin, but Toronto still has a great building block from the blueline in Morgan Rielly. The Leafs have committed themselves to an analytical approach to acquiring new players, and they’ve already changed the outlook of their team by jettisoning several veterans last season to make room for a younger lineup. Obviously, Toronto’s prospect strength starts with their forwards. Auston Matthews is all but assured to graduate from prospect status this year, but he still is the centerpiece of the Leafs’ youth movement and possibly the top prospect in the entire league. The Leafs will likely promote William Nylander to the parent club this fall as well, especially after the young Swede posted one of the AHL’s highest scoring rates as a teenager last season and put up 13 points in a short NHL audition. They also have one of the league’s most exciting young players, as Mitch Marner appears ready to make the jump to the professional ranks this season. The Maple Leafs have stockpiled draft picks under their new management regime, resulting in the deepest forward pool in the league. Outside their so-called “Big Three”, Kasperi Kapanen, Jeremy Bracco, and former CHL scoring champion Connor Brown. Defense and goaltending lag considerably behind the forward group in terms of talent, but the Leafs have an array of potential NHLers from their strong late-round drafting in recent years. Andrew Nielsen and Travis Dermott both had excellent seasons in the CHL, and recent KHL defector Nikita Zaitsev could help improve the Leafs’ defensive woes. The Coyotes haven’t had much success as a franchise, never making a Stanley Cup finals and only capturing one division title. After peaking with a heartbreaking Western Conference Finals loss in 2012, former general manager Don Maloney did a great job of rebuilding Arizona’s aging and declining core, acquiring Max Domi, Anthony Duclair, Christian Dvorak, and Dylan Strome in just a few seasons. The Coyotes have been languishing in mediocrity for the past few seasons, but appear to have turned the page on their past defense-first systems and now have some of the best young forwards in the league. While Domi and Duclair were opening eyes with their impressive play as rookies last year, Strome and Dvorak led their respective teams on deep playoff runs after each finishing with top-five point totals in the OHL. Oliver Ekman-Larsson has turned into one of the league’s premier defensemen, and Michael Stone and Connor Murphy both had strong years for a Coyotes club that was thin on young defensemen. 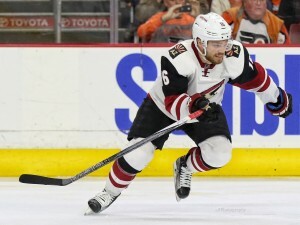 The Coyotes were able to hang around in the playoff picture for most of last season, so it wouldn’t be a huge surprise to see Arizona making a run for their first playoff berth since 2012 on the strength of their talented young players. Strome is most likely Arizona’s top prospect, but their forward depth is strong and has only improved since new GM John Chayka has taken his analytics wunderkind approach to the desert. The aforementioned Dvorak is joined by Christian Fischer and Nick Merkley, both of whom had excellent seasons in the CHL, and former first rounder Brendan Perlini. 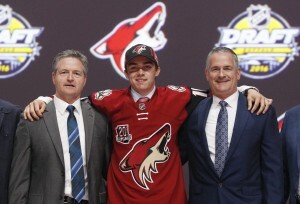 With their first pick in 2016, the Coyotes selected Clayton Keller, a player who was widely regarded as one of the draft’s best playmakers. The Coyotes also made a splash on the trade market, acquiring Lawson Crouse from Florida in exchange for taking on David Bolland’s albatross of a contract. Chayka also shored up a huge position of need in his first offseason, drafting Jakob Chychrun and Cam Dineen and trading for former OHL superstar Anthony DeAngelo. These three puck-moving defensemen give the Coyotes a few potential top-four defensemen. Goaltending is a position of need, but the Coyotes have Mike Smith locked up for the foreseeable future and young backstop Louis Domingue, who filled in for Smith admirably when he went down with an injury. The Blue Jackets are another young franchise that hasn’t experienced much success, making the playoffs only twice in team history. Before current GM Jarmo Kekalainen took over the team, the Blue Jackets had a spotty drafting record that undoubtedly set the team back. Thanks to an inept approach to developing their young players, top picks including Nikolai Zherdev, Gilbert Brule, and Nikita Filatov all failed to make an impact for the Blue Jackets. The Blue Jackets appeared to have turned a corner with an impressive playoff performance against Pittsburgh in 2014, but they’ve failed to make it back to the postseason thanks to a pair of key injuries to starting goaltender Sergei Bobrovsky. 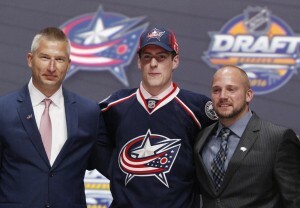 Moving 2013 first-rounder Marko Dano helped Columbus land all-star winger Brandon Saad from the Blackhawks last summer. Last season’s early-season struggles and coaching change also saw the Blue Jackets compelled to move franchise pivot Ryan Johansen, although they ended up with top young defender Seth Jones in return. Jones, Ryan Murray, and David Savard give the Blue Jackets a strong defensive corps moving forward. Kekalainen’s strong drafting track record with the St. Louis Blues was a big part of the decision to hire him, and he’s done nothing but stockpile draft picks and young players since taking over for former GM Scott Howson in 2013. Kekalainen has nabbed some great young players outside of the first round since taking the reigns, as high-scoring forward Oliver Bjorkstrand and netminder Joonas Korpisalo appear ready to contribute to the NHL team next season. Anton Forsberg, another late-round goaltender, had an amazing playoff run in the AHL next year and gives the Blue Jackets a good pair of goalie prospects. The Blue Jackets may have shocked fans in the 2016 Draft when they passed up Jesse Puljujarvi in favor of Pierre-Luc Dubois, but the QMJHL product has serious talent and could be the replacement for Johansen down the middle. Zach Werenski, the eighth overall pick in 2015, is one of the top defense prospects in the entire NHL and dominated the AHL playoffs as a teenager. Viral star Sonny Milano is also knocking on the door of the big club after spending a full season in the AHL last year and making a cameo with the Blue Jackets at the end of the year.